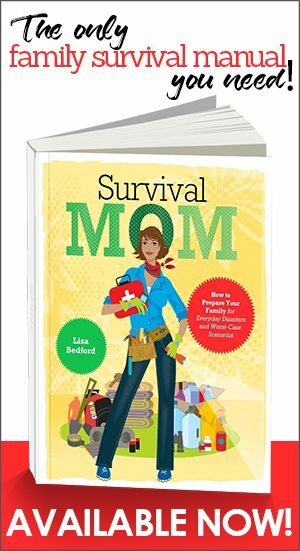 Moving is one of the most stressful things you can do, and moving with a full food storage and all of the emergency preparations that go with it can be super-stressful. It’s heavy, often fairly awkward (lots of glass jars in my case), and well, there’s just so much of it. An organized pantry makes cooking out of it easy and fun. We can all agree on that – but what if you have to move it all one day? 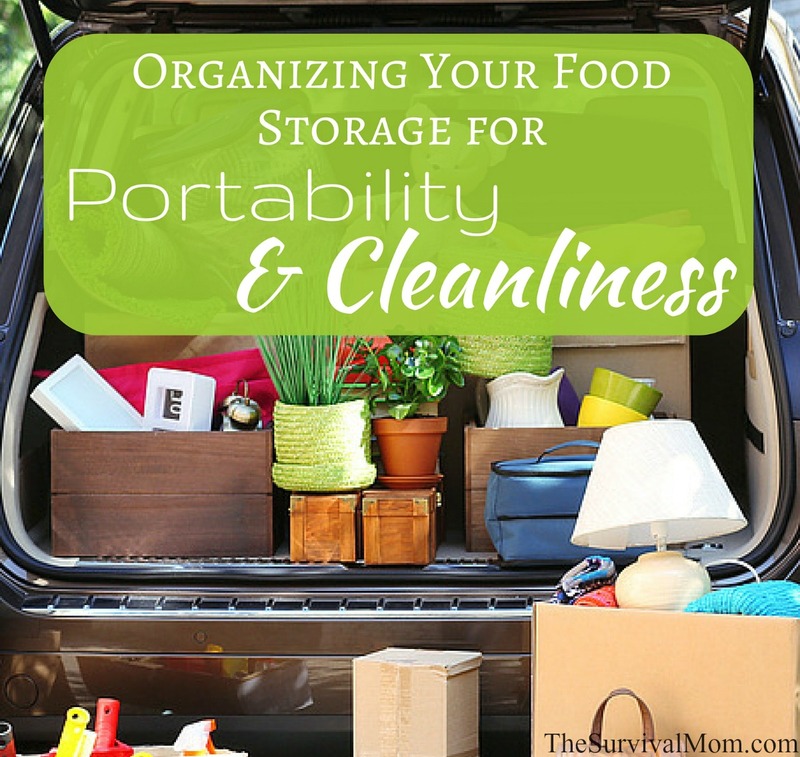 I recently did, and I was glad I started off my food storage on moveable racks. 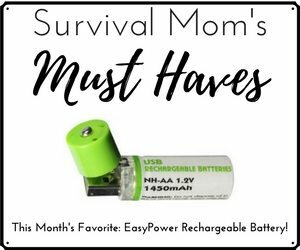 And even though I’m staying put for a while now, I can see how having my food storage set up this way will make life easier in the long run – whether I move or not. Here’s why. If you set up your pantry correctly, you’ll be able to clean properly. I recommend that your food storage be completely – top to bottom – cleaned and sanitized at least once a year (I do mine twice a year, when we change our clocks). This will give you a chance to find rusted cans, cobwebs, signs of rodents and other pests, and the most outdated food, which will likely still be edible. 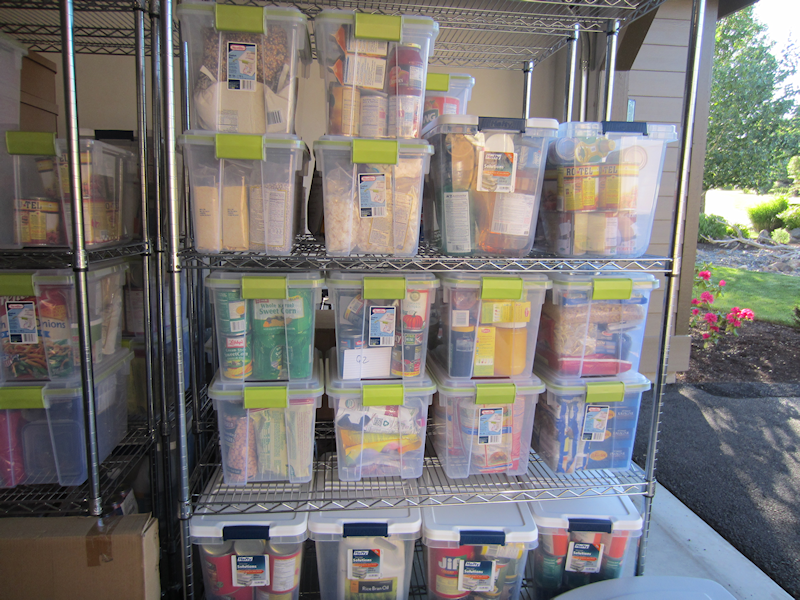 Making your food storage moveable means you can easily reconfigure it when your needs change. With a shelving system, you can store more because racks can be tightly stacked next to each other, and moved when the time comes to rotate your stock. (Uline, a commercial packaging company, has a fabulous sliding shelving system). Thrive Life has a shelving system that makes it easy to identify the food you have and rotate it. Moveable food storage makes it easy to set up a garage or spare room without building in a lot of fixed-position shelving. If you ever want to change the purpose of the room, your racks can be moved out easily. Check the load specifications before you buy. Make sure your shelves are heavy-duty enough to handle the weight you’ll be putting on them. Remember how heavy water is (a gallon is about 8 ½ pounds), and cans are also very heavy. Check to make sure the wheels are heavy-duty. Many shelf systems look great and are heavy-duty, but they cheap out on the wheels. So check unbiased reviews and if you’re very serious, call the manufacturer. The last thing you want is a broken wheel – it’s a hard thing to fix on a fully-loaded shelving unit. Make sure that the wheels are actually included – sometimes they aren’t. Some units (especially very inexpensive or smaller) are not meant to be moved when loaded – check with the manufacturer if in doubt. Mix inexpensive lighter-duty shelves with heavier duty shelves for maximum economy. 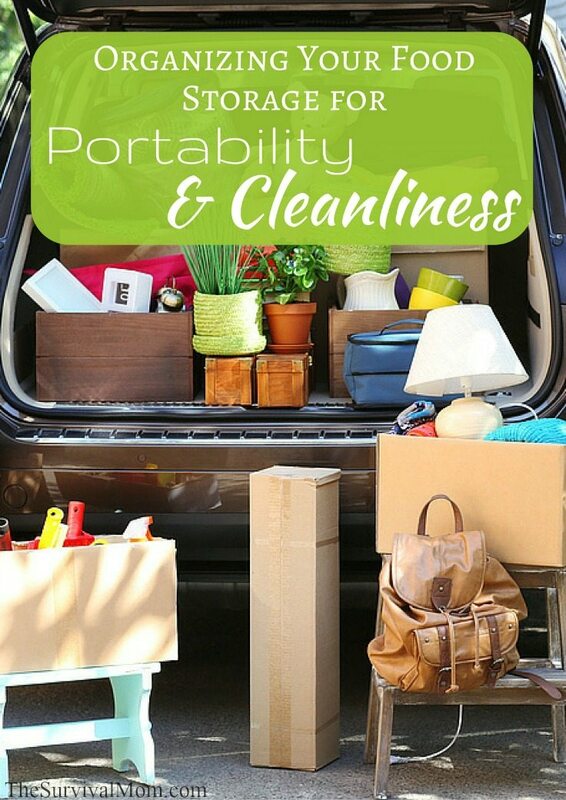 Make sure the moving truck is tall enough to accommodate your shelving – including the wheels. Very important: in addition to checking the height of the inside of the truck, check the door height as well. I had some shelves that fit within the truck but were 2 inches taller than the door. Not a happy discovery! Wrap your shelves with stretch wrap to keep everything from sliding off. If you want to keep the contents private, get black pallet stretch wrap. Remember, movers will see the contents of your bins, and they know where you live. Your moving truck should have a ramp so you can slide your shelves in easily. Know where your racks are going to live in your new location, and create a plan using grid paper. Then, label each shelving unit so when you arrive, the movers can put each rack in the right place. This will save you a lot of time and effort. By the way, shipping containers can be insulated, just in case that is a practical option for you in your move. I also recommend keeping your food storage in clear bins (assuming your storage area is not full of sunlight). Boxes are skidded around warehouses on floors and dirty equipment. Rats and mice may have crawled over them, for all you know. Make sure your bins will fit in an optimized way on the shelves you have (or are planning to purchase). Check the front-to-back dimension as well as side-to-side. Use gasket bins for things critters can get into. There’s a new bin by Sterilite that has a gasket on it. It’s not 100% water/air proof, but it’s a tighter seal than I’ve seen on any bin before – and I’m a bin connoisseur. Use less-expensive bins for cans – the gasket bins are a little pricey, so get cheaper bins for cans of things (since these don’t attract critters). For your home-canned goods, consider a sturdy, more permanent box instead of letting your precious jars go free-range (a slight earthquake, and you could lose it all). I really love these pantry storage boxes from Pantry in a Box. She sends them with a white-board label, so you can re-label easily. So if you’re just starting out on building a substantial food storage, or considering re-organizing what you already have, please consider using moveable shelves. A well-organized food store is a pleasure to cook out of and makes being prepared a happy choice. 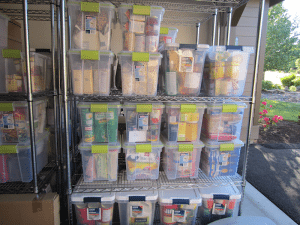 “A Round-Up of Food Storage Resources” — My best food-storage articles, videos, and tips. Guest post by Nancy Smith who blogs at Prep Happy. 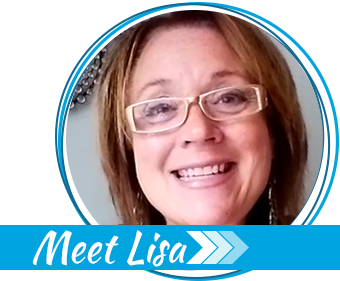 Visit her blog to read more and sign up for her email prepping course. Originally published July 22, 2013. Hi! Can you tell me what size clear bins you have? I like the size of the 66 quart bins, but can only find the gasket lid on 20 quart bins, which I think might be too small. Have you found larger bins with the gasket lid? Thank you! Thank you for the inspiration. 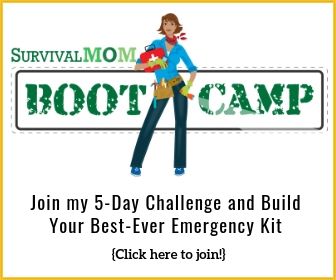 Not only is this great for preparedness but just everyday life in general. We try to live as frugal as we can so being able to organize our food like this and see what we have will help with our budget. So many times I buy things I already have because I can’t find it and won’t have an ingredient I was sure I had. This is going to make my life a lot easier when preparing and organizing for six people. The temps here fluctuate so much and my garage isn’t temp controlled, do I need to have a temp controlled environment for canned goods? Years ago I read about RV travel. The author suggested slipping quart glass jars into tops of my hubby’s old athletic socks (after cutting off the foot portion). A good way to recycle those socks with holes in them.